Carlos Hernandez is an artist/printmaker based in Houston, TX. 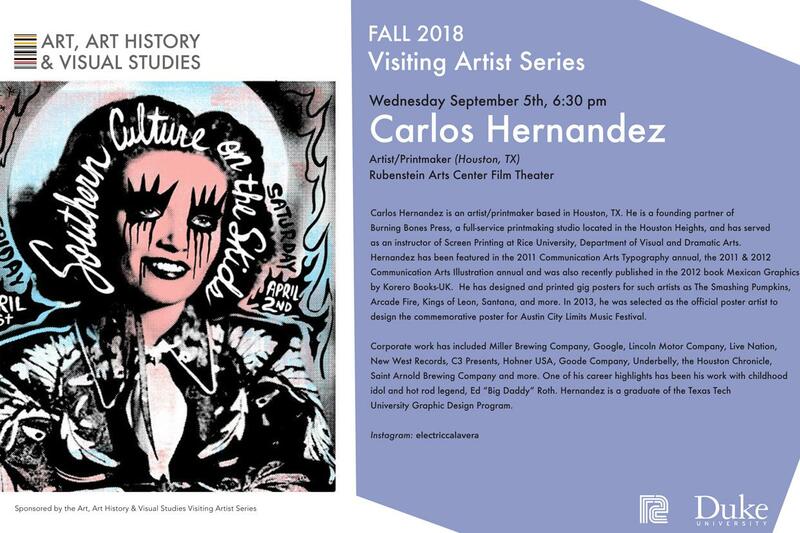 He is a founding partner of Burning Bones Press, a full-service printmaking studio located in the Houston Heights, and has served as an instructor of Screen Printing at Rice University, Department of Visual and Dramatic Arts. Hernandez has been featured in the 2011 Communication Arts Typography annual, the 2011 & 2012 Communication Arts Illustration annual and was also recently published in the 2012 book Mexican Graphics by Korero Books-UK. He has designed and printed gig posters for such artists as The Smashing Pumpkins, Arcade Fire, Kings of Leon, Santana, and more. In 2013, he was selected as the official poster artist to design the commemorative poster for Austin City Limits Music Festival. Corporate work has included Miller Brewing Company, Google, Lincoln Motor Company, Live Nation, New West Records, C3 Presents, Hohner USA, Goode Company, Underbelly, the Houston Chronicle, Saint Arnold Brewing Company and more. One of his career highlights has been his work with childhood idol and hot rod legend, Ed "Big Daddy" Roth. Hernandez is a graduate of the Texas Tech University Graphic Design Program.